Brooklyn, NY - IN PHOTOS: Park Slope Celebrates Grand Opening Of First Kosher 'Mikvah"
DNAinfo.com (http://bit.ly/131bWn2) is reporting that the 15th Street building now features a women’s mikvah, replete with elegant lighting, candles and a trickling waterfall on a subterranean level, as well as a men’s mikvah on the first floor. 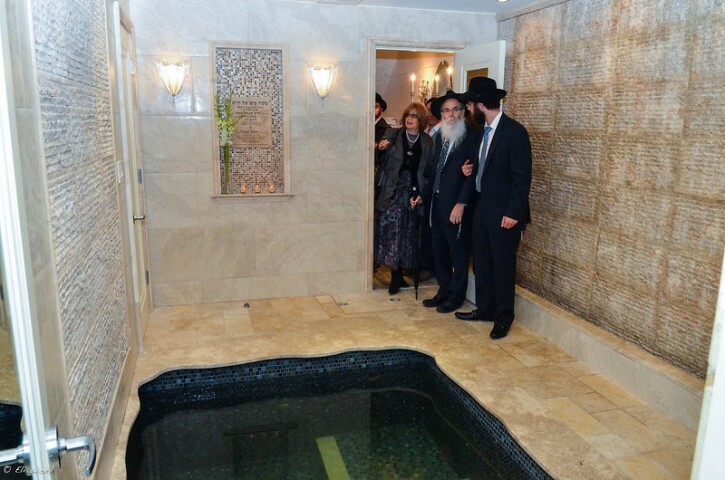 Guests said that it is always worthy of a “big” celebration whenever a mikvah is built because it means more couples are getting married and starting families. “it means we are thriving,” said one guest. This looks very impressive in terms of style. But is this a Mikvah only or some small hotel? I never heard about bed rooms in mikvahs before. Happy to see everyone (Chabad with other chasidim) doing their part to help Klal Yisroel to fulfill this most important Mitzvah. OMG!! Wow!! I would forget to come out!! What a beautiful mikveh, Hashem should bless the donors and rabbi Hecht for all the hard work and money that went into this beautiful edifice. wow beautiful mikvah and hospitality suites!! I spy Elyon Systems! Great job! Kol hakovod to all the donors to this project. I suspect they are going to get lots of customers from BP and Willy where many of the mikvahs, while technically kosher, still look like and smell like something of out of a third world bath house. Beautiful. But why do you need separate men's and women's mikvaos? It's not like they're using them at the same time of day. There is a men's mikveh also. One Stop Shopping! in case u never noticed the women have a very different interpretation then men of what constituts a clean bathroom ... a big kal vechomer a womans mikva. pls dont take this the wrong , no offense meant but i dont think you are u married and certainly dont have any daughters.though i have been wrong before. It avoids the uncomfortable risk of men and women meeting there and provides security to all that this is an impossibility. Friday afternoon and erev Yom tov the facilities are used by both, although not necessarily the same areas. And they need separate preparation areas regardless. Separate everything is definitely the right choice. And I'm not even discussing erev Yom Kippur. With all due respect, the Williamsburg mikvah is a nice one. I have used it when I lived there. I have seen a mikvah that needs renovation, but not in Williamsburg. Actually no, I go to a public mikvah and used to live out of NY state and I saw mikvah in worse condition so I do know what I am saying. I believe there is a halachah issue for men and womens mikva. Please do not quote me as I can be wrong here. But I believe a womens mikva the water has to be all or mostly rain water. A mens mikva has to be rain water but can also have be filled with a nice amount of faucet water when the water goes down. So yes men can use a womens mikva but a women cannot use a mens mikva. As everyone else pointed out already there is just common sense reasoning as to why there are two different mikva's. So where is the location of both places? Is it all one building?